Google prefers to return a uniquely-fitting URL for a search term. Aside from a few exceptions, it is useful only to rank for one keyword with one URL. When it comes to highly contested keywords, Google will often change the ranking URL of your page. Due to these changing URLs your website will often remain somewhere above rank 11+ on Google. In this tutorial, we will show you a one-click feature which will quickly show you those search terms where more than one URL ranks on Google. You probably know the problem: Google ranks your webpage for interesting search terms, but not with the URL you actually to rank. When in doubt, Google may simply change the URL around every week, or rank two URLs at the same time but 10+ positions apart and often only on page 2 or beyond. In that case, Google does not know on which URL you focus your content for a specific topic. You should search for these keywords and try to improve it by using OnPage-measures. First, start by typing the domain into the search bar of the SISTRIX Toolbox. In the navigation menu on the left, choose the entry “SEO > Keywords” to show a list of all the rankings for the domain. Next, choose the “Keywords with more than one ranked URL” feature in the options for the table, by clicking on the cogwheel in the top right-hand corner. Once the feature is activated, you will see the ranking table once again, but with a new column added. There you will see how many different URLs are ranked on Google for the chosen term. We will use the domain “selbst.de” to show you how helpful this feature is. You can check this step by step in your account, whenever you want. We type in the domain “selbst.de” and take a look at the keywords. Based on experience, the most serious problems happen from position 11 onwards. Therefore, we directly activate the filter “Position 11 – 100” by clicking on the button “Add Filter”. Now we only see those terms where more than one URL is ranked on position 11 or lower on the Google Search Results Pages. Next we check the details by clicking on the column “#” for the keyword “Glasbausteine” (glass bricks) and write down the two URLs there. On the keyword list there is an icon in the second to last column where you can open the keyword history for the domain. Click this button to see which URLs have rankings for the keyword “Glasbausteine” (glass bricks) in Google, including the when and where. You will now see the two URLs that change places for the best position, but are unable to get a stable position within the Google Top 10. Partly, the rankings drop to position 70 and during some weeks, no URL for the domain is shown for this keyword at all within the top 100. Google knows that both pages have something to do with glass bricks and it tries to figure out which URL is most relevant to the users’ search terms. That’s why the URLs keep changing. Both URLs have something in common, however. 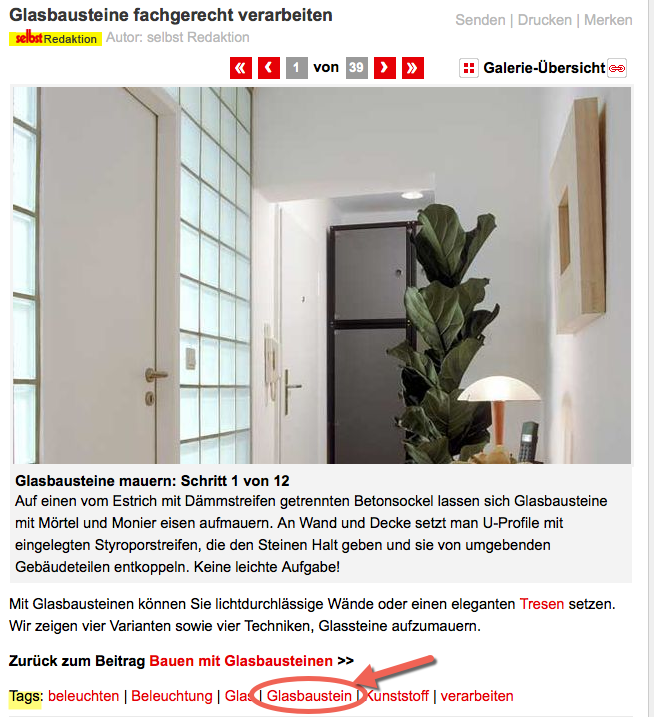 They link to an overview page by using “Tags” with the term “Glasbaustein” (glass brick). All relevant content is listed on the overview, but it is missing an introductory text and so on. Which means that this page is not the optimal ranking candidate just yet. With its own content and perhaps a pretty picture with a fitting title and alt-attribute, the page should soon be relevant for “Glasbaustein” (glass brick) in Google and rank in the Top 10. Below you can see the ranking history for a term that did not previously have a clear focus on the topic, where pages which only loosely mentioned the keyword were ranked. After creating a thematically fitting entry-page, this page managed to rank in the Top 10 for months, instead of fluctuating between position 60 and 70. Try to avoid ranking for a search term with multiple URLs on your domain. 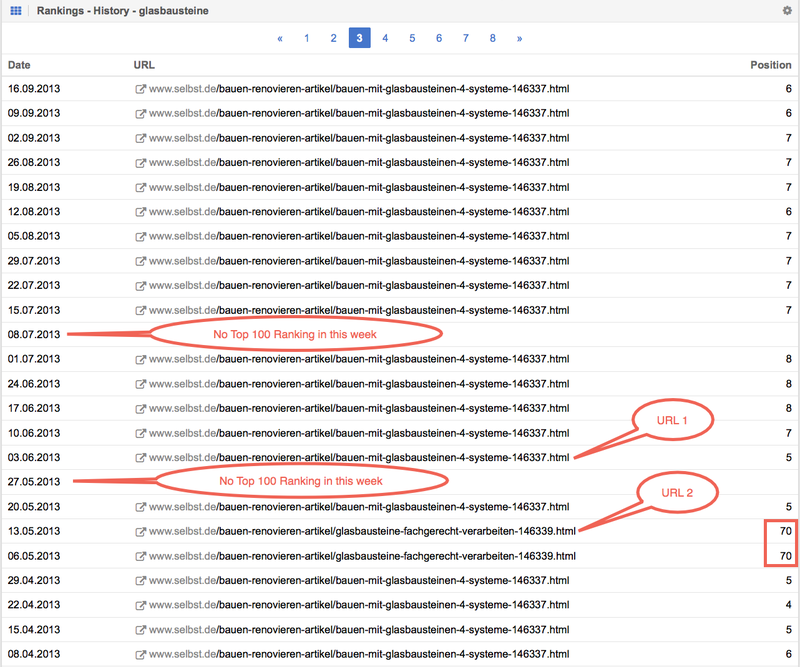 In most cases, this will persistently prevent good rankings. Choose one of your existing pages to serve as a main-page to be linked internally and improved in terms of content, or create a completely new page for the topic and integrate it cleanly into your link and navigation structure.